Taylamade WOW BROWS Masterclass , March 10th & 11th 2019! We underwent a change in ownership in May 2015 and this has altered little to the training we provide but has seen new incentives implemented and new ideas to ensure only the best training is given to our new students and returning students at all times. All our staff underwent training late last year in Maintain Infection Control Standards In Office Practice Settings and adhere to this at all times within our own cosmetic tattooing procedures with clients and when teaching all our students. Our aim is to continue offering excellence in training at all levels, from Beginners to Advanced and from Refresher courses to continuing education courses. You may be looking to add Cosmetic Tattooing as a treatment to your salon or clinic or looking for a new and profitable career, whichever the reason you are in the right place. The Melbourne College of Cosmetic Tattooing is built on the fundamental of equipping students to reach excellence with the highest professional standards as cosmetic tattooists. This assures that our students become highly skilled, competent and knowledgeable thus enabling them to set the standards in the cosmetic tattooing industry. Melbourne College of Cosmetic Tattoo uses a Rotary Bella Dragon machine. You do not have to be a beautician. It’s about being creative, having an eye for detail and an artistic flare! We welcome you to spend a few quality hours in our training centre with our trainers and acquire a feel for the industry. You are able to try out the machines. Our trainers have been trained specifically on rotary machines and have trained with some of the most prominent trainers around the world. Our schools recognised as one of Australia’s premier trainer providers and technicians of the Slope needle techniques. Models required all year for Hairstroke Eyebrows, Eyeliner & Lips. Enquire within! Become an accredited cosmetic tattoo professional. We equip you with the skills necessary to become a professional cosmetic tattoo artist with your own clients. We provide in-depth training across several Certificate Courses. Our courses provide you with a comprehensive skill set to launch or further your cosmetic tattooing career. Learn the art of tattooing and shaping eyebrows for all face shapes. 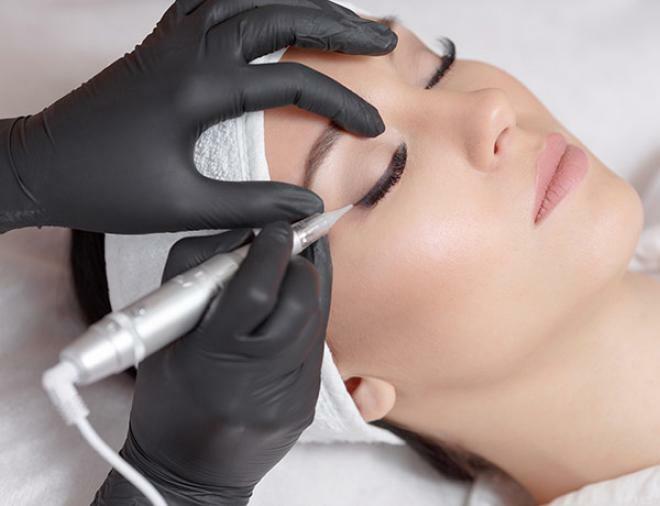 You will use both the machine and the microblading technique. Learn the art of tattooing and shaping eyebrows for all face shapes. You will use both the machine and the microblading technique with two extra days of working on models. Master the art of blending colours and hues. Practice on two in-class models. For experienced cosmetic tattoo artists only. For experienced cosmetic tattoo artists looking to refine their rotary tool skills and finally master ‘problem areas’ where they desire more experience. For technicians wanting to Master their Microblading technique. For those looking to become proficient in shading and stippling, our dedicated course will help you master two of the most fundamental tattooing techniques. Measuring the points of the face and hand drawing the shape and design of the tattoo are two of the most essential cosmetic tattoo skills. Master them both in this course. 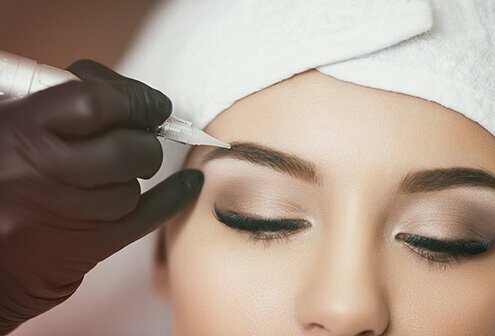 Dermaplaning is a revolutionary new technique that's quickly growing in popularity. Our trainers guide you on how to properly use a dermaplane tool and leave your clients with healthy, glowing, youthful skin. Many clients prefer henna pigment for their eyebrow tinting as it's plant-based, temporary and leaves eyebrows looking defined yet natural. Learn how to incorporate henna brow tinting into your current skill set. You may be looking to add Cosmetic Tattooing as a treatment to your salon or clinic for two reasons. Firstly your clients care about their appearance and secondly they are satisfied with the service and services you provide. They feel you care about how they look as well, so it is important to your business that you make all efforts to keep yourself up-graded in the services being offered elsewhere. We recognise the importance of the above to professionals such as yourself but in the cosmetic tattooing industry being able to say you have this service to offer is not enough. Remember, this is SEMI-PERMANENT! You need the best possible training that is available to you with the latest product information and technology in the world today. Looking For a New and Profitable Career? If you are not already in the beauty of aesthetics business it is still a very viable career as salons are always looking for competent and confident tattooist technicians with recognised expertise and trusted qualifications. Alternatively, you may be looking for a total career change, either way this is to be the change of a lifetime for you.